Kuala Lumpur, 18 Aug: Of Isa Samad, I've written on this blog too many times, none of them with great fondness. But when photographs of this ex-Negri Sembilan Menteri Besar, ex-Felda-FGV Chairman, ex- Umno Vice President, and soon probably ex-SPAD acting Chairman splashed the front pages of the local dailies middle this week, clad in the unmistakable orange pyjamas of SPRM (the Malaysian Anti-Corruption Commission), I hesitated in making a posting. The pomp and the parade ... there's something not right about the whole thing. Lawyer N. Surendran, who is also a Member of Parliament, may have a moral point here. It is not just humiliating but premature to dress Isa in that bright orange uniform and paraded him in front of the media as if he had been charged and found guilty. When, in fact, you were just producing the suspect in court for a remand order to question him further on suspicion of corrupt practices. 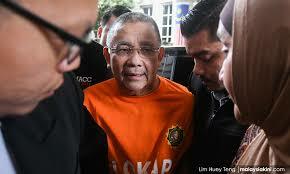 This is not to say that the blazer Isa had on when he was arrested by the anti-graft officers was less of an eye-sore! 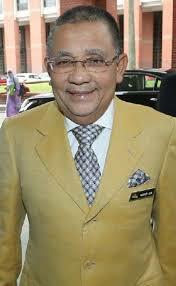 A sober, dark suit or batik or a Baju Melayu complete with songkok would probably have done better for his PR. Rarely, I am also with Akhbar Satar, the Transparency Insternational-Malaysia president. Let Justice Takes Its Course. But the first person who should listen to his advice is Akhbar himself. One minute he says we must always bear in mind that Isa is innocent until proven guilty. The next minute, he proclaims that Isa's arrest is a signal for the government to End political appointments in GLCs. Akhbar, moronically or not, has already found Isa guilty! Sometimes I think Akhbar is no different from some Opposition politicians who would go out of their way to discredit MACC whenever one of theirs is taken into custody for alleged corruption is expected. To them, the Commission is doing their job only if others, preferably their political rivals, are involved. It's the childishness in these politicians that we've come to expect and which is holding the MACC back. When it suits them, they hail themselves as "friends of MACC". 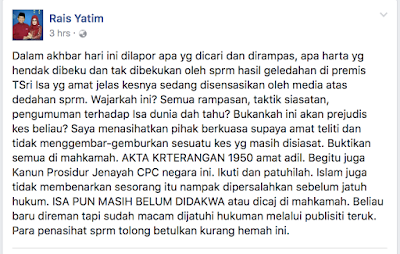 "Sometimes I think Akhbar is no different from some Opposition politicians who would go out of their way to discredit MACC whenever one of theirs is taken into custody for alleged corruption is expected. To them, the Commission is doing their job only if others, preferably their political rivals, are involved. It's the childishness in these politicians that we've come to expect and which is holding the MACC back. 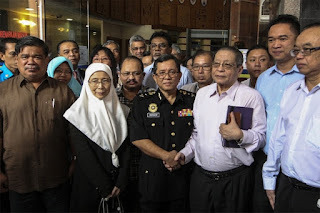 When it suits them, they hail themselves as "friends of MACC". The old (and functional) MACC wanted to charge your BFF, MO1, until the pink-lipped pirate placed a compliant stooge in place to block it. 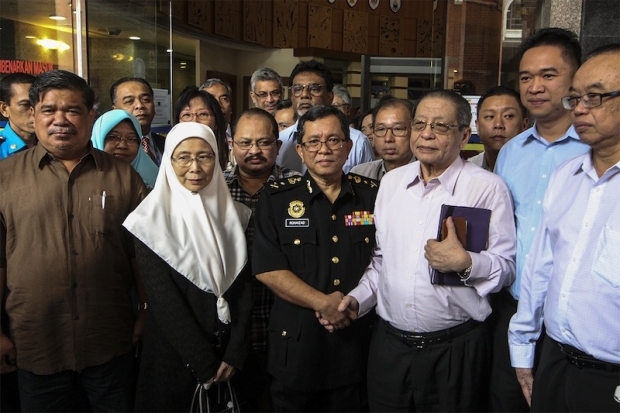 Why doesn't the MACC investigate Mrs MO1 and her 2 million over the counter at Affin? Why doesn't the MACC investigate MO1 and his long trail of theft from SRC and 1MDB? b) Those who are blinded by the dedak particles in their eyes. Former prime minister Dr Mahathir Mohamad has said he is “willing to work” for the people to return Malaysia to its former glory days. 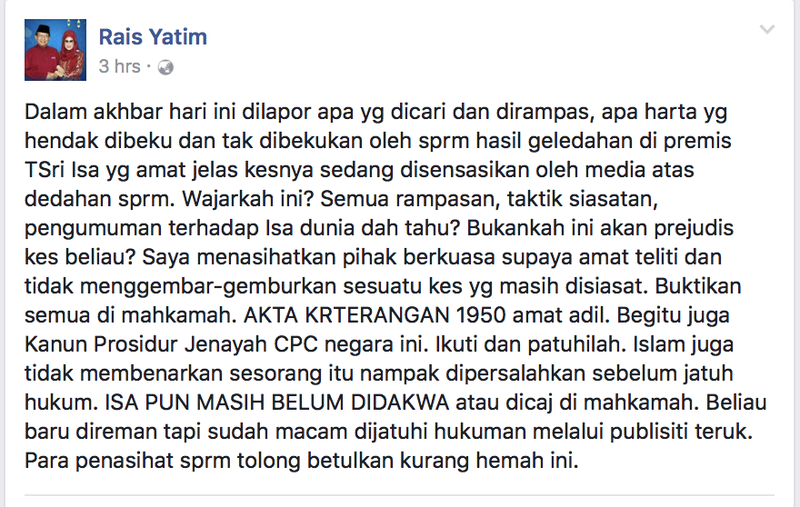 He said many Malaysians today had become ashamed of admitting to outsiders that they were Malaysians as the country had gained a reputation for corruption and having “thieves and pirates”. “I am sure people are asking what has happened to your country … there is no more democracy. “If you want to get rid of them, please vote for Pakatan Harapan in the next general election (GE14), he added in reference to the country’s current leaders. “I am 92 now, I don’t know how many years I will be around but I promise, so long as I am here, when we form a new government, we will return Malaysia to its former glory. “That is the former glory before Najib Razak and Abdullah Ahmad Badawi,” he told a ceramah before some 3,000 people at the Padang MPSP in Kepala Batas, the former stronghold of Abdullah for 35 years. Ahhhh, but I prefer the current era where Malaysia is scorned globally for keeping a complete kleptocrat and thief in power. I suggest the MACC or the Police to shroud the head of the accused with gunnysack... especially those who wears a religious skullcap or tudung so that Islam would not be tainted with bad perception... each time they where being drag in public to Court or anywhere. So the question of orange pyjamas or handcuff, does not arise. You cannot differentiate between the meaning of arrest( detain) and charge. Isa only had been detained/arrested. Read carefully and ask someone who knows about the corruption act before you write. What is it with the Johor Palace and KJ?